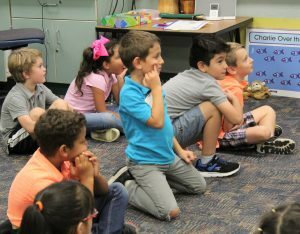 To find out what the elementary students are doing and learning in their “specials” (music, art, P.E., computer, and media center), we visited West Goshen Elementary. 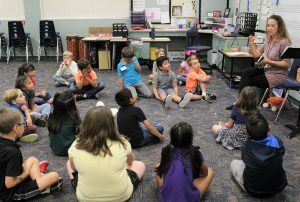 What we discovered was that the students are learning so many things that they will use later on in their GCS career. 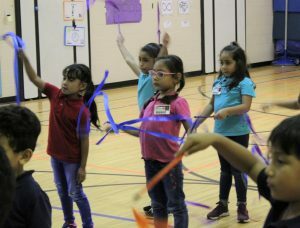 But since they are learning the skills by playing games and having fun, they may not even realize they are building a foundation for band, orchestra or choir, or AP/IB art, Winter Guard, Computer Repair, high school athletics, or Percussion. 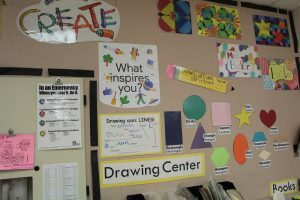 The teachers of the special classes are also encouraging students to find and use their creativity in new ways. 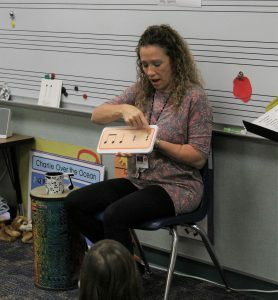 Below, West Goshen music teacher Angie McLaughlin was teaching students how to read rhythms by having them “Say it, tap it, and clap it”. 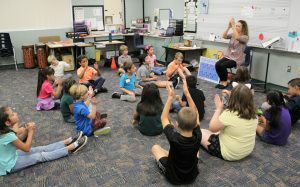 The students were also learning to recognize whole notes, half notes, quarter notes, eighth notes, sixteenth notes, and rests. 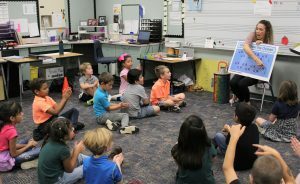 They played a little game where it was Mrs. McLaughlin vs. Mrs. Park’s class, and the students won 4-1 because they did a great job clapping out the rhythms and made hardly any mistakes. 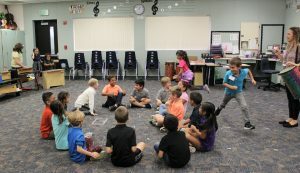 The 2nd graders’ goals for the day were: I can clap rhythms, I can sing while matching pitch (high/low), and I can keep a steady beat with a song. 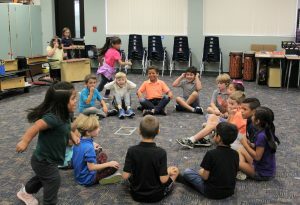 Mrs. McLaughlin explained that the students were working toward their goals by playing games and practicing their music skills, “by singing and by keeping a steady beat”. 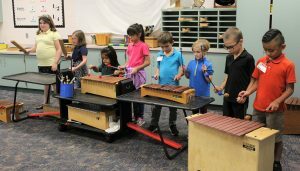 They learned the song “Charlie Over the Ocean” and then practiced keeping the beat with the song while not clapping on the rests. 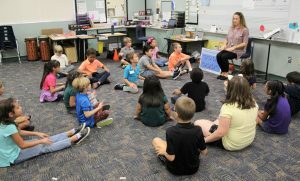 Once they had learned the song, Mrs. McLaughlin said they would play a game using the song and some of the instruments in the room. 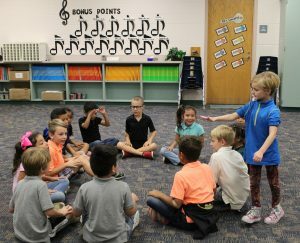 “It will be kind of like Duck, Duck, Goose, but we will be singing our new song and keeping the beat with our hands and our instruments.” The student who was “it” went around the circle tapping classmates on the head to the beat of the song. 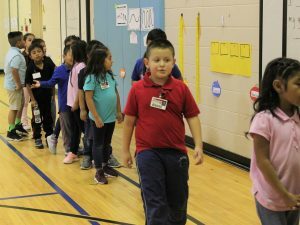 On the last beat of the song, the student who was tapped and the student who was “it” raced around the circle in opposite directions. 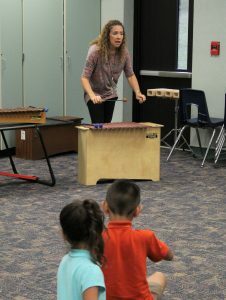 The person who got back to the spot in the circle last went over to the instruments to help keep the beat there, and then the students kept rotating to the instruments, through all of the instruments, and then back to the circle. 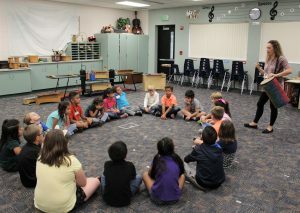 The students did a great job playing the instruments, and they learned about a new instrument called the Slap Stick. 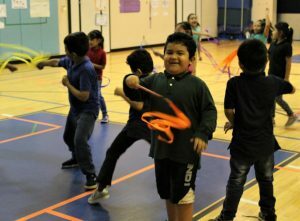 They had a great time with the slap stick. 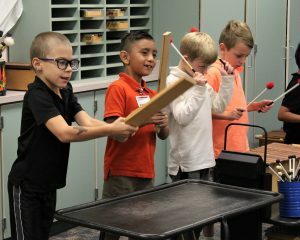 The instrument only made one sound, but it was a very loud, very satisfying smack! 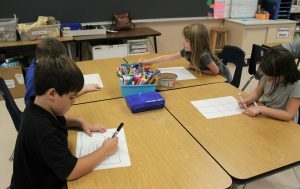 Next, we moved on to the art class…When students enter Ms. 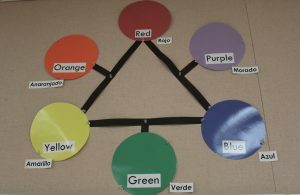 Crystal Butler’s classroom it is filled with color, shapes, and elements of art, with color names displayed in both English and Spanish. 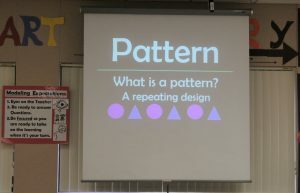 Ms. Butler asked the students if they remembered what they had talked about the last time they met for art, and the students remembered that they were talking about patterns, or a “repeating design”. 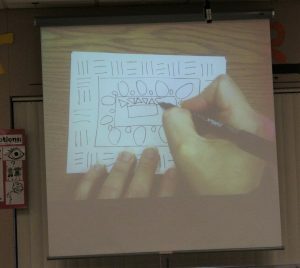 They gave examples of things that could be used to make patterns, including lines, letters, colors, numbers, pictures, names, and shapes. 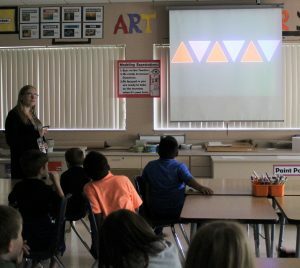 Ms. Butler explained more about the use of patterns in the making of art, and used technology to demonstrate one of the ways patterns could be used in their lesson for the day. 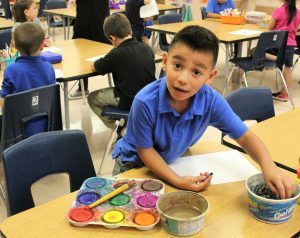 The students got their papers, and then got to choose if they wanted to work with paint, markers or crayons. 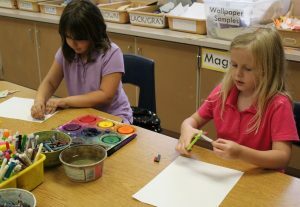 Once they had chosen what they wanted to work with, they got busy making their own patterns and designs. 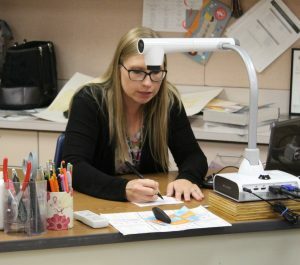 And hey, it was this student’s birthday. So, happy 7th birthday to you, young man!! 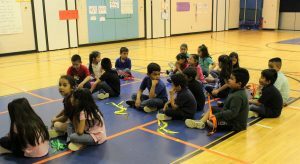 From there, we went to the gym where the students were using ribbons and patterns to lead their activity and movements. 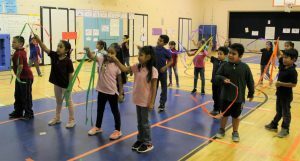 Their goal for the day: Become more knowledgeable about ribbon movements and use the skills of a communicator with my group to create and perform a ribbon routine. 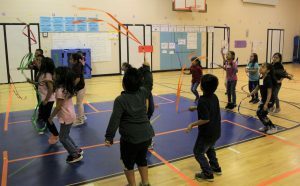 After they had mastered the circles, squiggles, figure eights and other patterns on their cards, they added jumping to their ribbon movements, increasing the difficulty for the students. 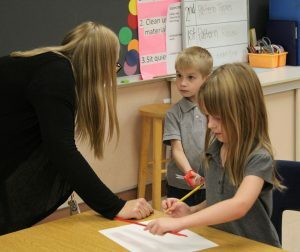 And all too soon, it was time for the students to go back to the classroom. 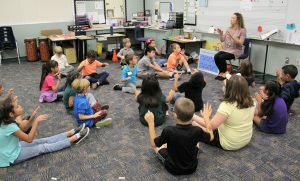 This is only a brief glimpse into what elementary students do in their “specials” classes, as they dig into art, music, computer, P.E., media center, and for some, a foreign language. 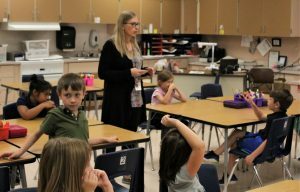 The students are building a good foundation for the subjects they will study later on at GMS and GHS. 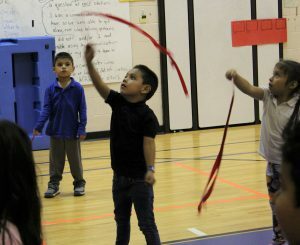 They are also being given the opportunity to try many different activities to help them discover their own gifts and interests. 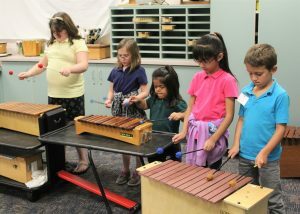 What a joy it was to witness the enthusiasm of young students learning new skills and discovering new ways to express themselves. 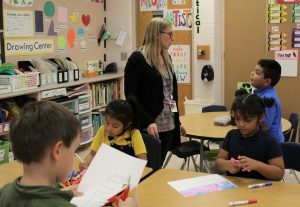 Thank you, West Goshen for allowing us one last glimpse at how elementary students learn and grow. 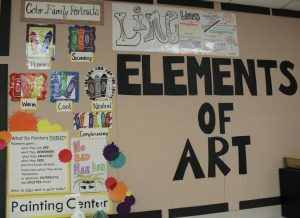 Next week we will begin to look at the growth and development of GMS students.